A big part of teaching kindness to children is teaching them the power of language to help and hurt others. With Spanish learners it is especially important to give them the language they need to help others and treat them well. 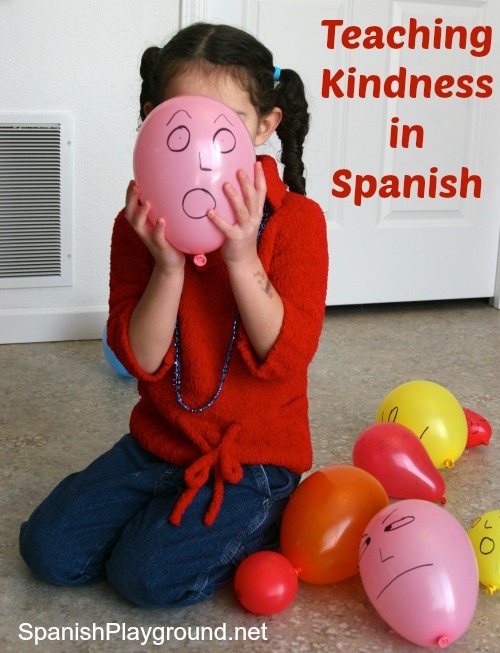 Here are some ideas for teaching kindness in Spanish. Below you’ll find Spanish phrases for teaching kindness. This language helps kids be kind and generous. The same sentences are used in the Kind Words Sorting Activity below. Try these activities to teach kindness to children and help them acquire the language they need to communicate their care for others. Colorear y aprender has a set of coloring pages that focus on courtesy and cooperation. The pages have Spanish sentences about the values they depict. The pictures show situations, so you can talk about how the people are being kind to others, to animals or the Earth. Part of being kind is being able to identify how others are feeling and respond. One way to practice identifying emotions is with faces on balloons. Draw faces of different emotions on balloons and bat them around the room, to music if you like. When the music stops everyone catches a balloon. Kids identify the emotion on the balloon and mention something they could say to that person. The balloons in the photo show está triste, está asustado/a, está sorprendido/a, está contento/a. In a post about my class rules, I included a printable for making a paper chain. The rules focus on cooperation and being respectful to each other, but you can easily expand the activity to teaching kindness in general. The vocabulary listed above would work well on the links of the chain. This activity uses the phrases on the printable Kind Words Sorting Activity below. I made it as a reading activity, but it can easily be adapted for listening or speaking. As a reading activity, kids can work individually to sort the phrases into kind and unkind words. They can cut them apart and sort them onto a smiling face and a sad face, or they can color or mark the boxes in different ways for each category. As listening activity, you can read the phrases aloud and kids can categorize them. To include a speaking component, kids can draw phrases and read them aloud. More advanced students can use the phrase in a short conversation. It is important to be teach children to be kind to the Earth as well as other people. Kids Yoga Stories has a variety of resources for teaching kindness to kids through yoga. These include a Kindness Focus Yoga Pose. The kindness yoga pose is Tree Pose. Movement and acting out words are an excellent way to help children internalize language. As you do the tree pose, talk about el árbol, el tronco y las ramas. Talk about how the tree sways in the wind: El árbol se mece en el viento. See the Kid Yoga Story post for a description of the tree pose and more ideas for using yoga for teaching kindness to children. I love this! We’ve been having a kindness problem around here so I can’t wait to try these.